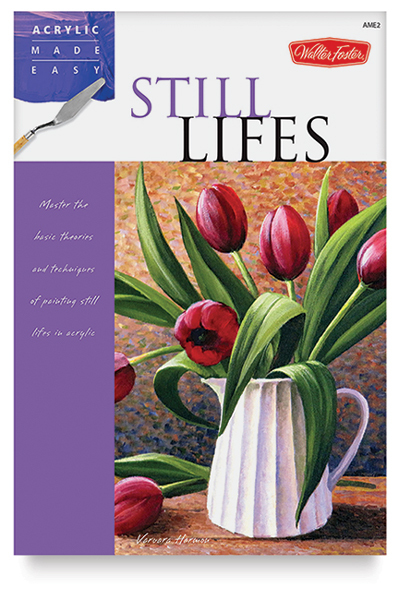 Acrylic Made Easy: Still Lifes offers a fresh and simple approach to creating beautiful still lifes for beginning and intermediate artists. Covering a breadth of subject matter, from florals and tablescapes to fruits and vegetables, it's filled with helpful information that not only instructs but also inspires. Beginning with an introduction to a variety of tools and materials, accomplished painter Varvara Harmon leads artists through a series of simple, step-by-step projects that begin with a sketch and progress on through to beautiful finished pieces. 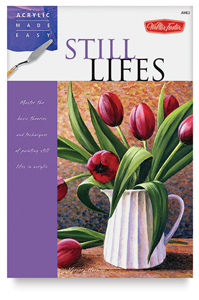 Along the way, artists learn how to select the right brushes, palettes, paints, paper, and surfaces for their work. They also learn the basics of color theory, color mixing, composition, and perspective, as well as techniques such as glazing, scumbling, stippling, and more. Paperback. 64 pages. 6½" × 9½" (17 cm × 24 cm).